Dr. Melanie Logue earned her dual PhD/DNP from the University of Arizona College of Nursing in 2011. During her graduate education, she worked as a research associate on a National Library of Medicine (NIH) funded project with her mentor, Dr. Judith A. Effken. The purpose of the research, titled Dynamic Network Analysis Decision Support Tool for Nurse Managers (DyNADS), was to use computational modeling that allows nurse managers to assess the organizational health of their patient care units and then engage in strategic planning through automated analysis techniques to improve their actual units’ safety and quality outcomes. This work gave her research experience in cognitive work analysis (a qualitative approach), survey methodology (a quantitative approach), and dynamic network modeling and is summarized in part in two papers published in the Journal of Nursing Administration (2010) and the International Journal of Medical Informatics (2011). Dr. Logue completed her two-year appointment at the University of Arizona as a Clinical Outcomes and Comparative Effectiveness Research (COCER) Academic Fellow in the Health Outcomes and Practice Effectiveness (HOPE) Research Center and serving as Clinical Assistant Professor. Dr. Logue has worked as a primary care provider serving different populations and communities in her native state of Arizona for over 15 years. Her clinical experiences are what incited her interests in preventing disability and improving health outcomes in vulnerable populations. Dr. Logue’s research is aimed at older adults with chronic illness and applying health information technologies (HIT) to prevent disability and empower self-management. She has developed and validated a conceptual model for predicting the barriers and facilitators to adopting personal health records (PHRs) and will be expanding and testing the model for its use in guiding effective interventions. Using her expertise in HIT, experience as a health care provider, and her research and practice doctorates, she plans to advance her translational science and improve healthcare delivery for seniors. Dr. Logue served as president for the nurse educator chapter of the Arizona Nurses Association. She is an active member of the American Nurses Association, the American Academy of Nurse Practitioners, the Arizona Nurses Association Political Action Committee, and Sigma Theta Tau Nu Epsilon Chapter. Dr. Logue was inducted as Fellow of the American Academy of Nurse Practitioners and served as the Arizona State Representative. 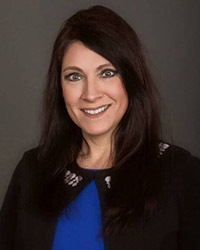 She was appointed to the Arizona State Board of Nursing where she served for two years prior to coming to the University of St. Augustine for Health Sciences. Prior to joining USAHS, she was Dean/Associate Dean of a large college of nursing and health care professions in Phoenix, Arizona.